Most keyboards are “beefy” manly objects. They dominate the space and are filled with “gadgets” and functions. The Apple keyboards, by contrast and thin and stripped down to the essentials. If you use a Mac you most likely will be using a mouse; no need for extra buttons on the keyboard. Who needs “CTL” “ALT” and “DEL” …. What a crazy way to start a computer? Who thought of that. I wanted the freedom of wireless (bluetooth or radio frequency) but I didn’t want to fill up my desk. I don’t use one of those “keyboard trays”. I prefer a large expanse of desk and a large expanse of screen. I also like a quiet keyboard with little travel. I type fast and don’t like to exhaust my fingers. For me, the DiNovo was perfect. It’s the one on the left below. Except for that BATTERY issue. After spendin g time at BestBuy testing each keyboard (including opening the boxes), I finally settled on the 2 keyboards below. 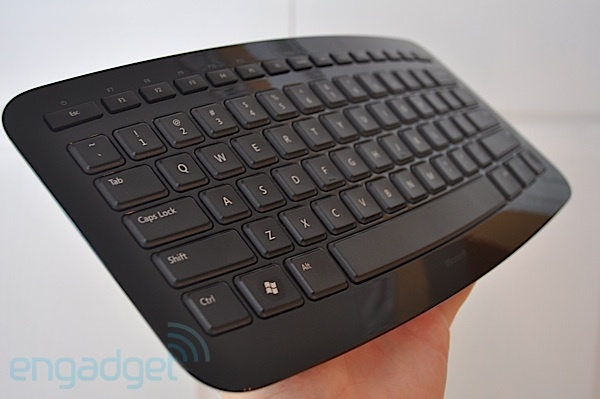 One is from Microsoft … make of cheap keyboards. It was their attempt to work with a designer (not some geek you keep locked in a cell who lives on pizza). The result was a line of unusual peripherals that would look good in an art studio. The ARC line, which includes a flexi-mouse (which I didn’t buy—I prefer trackballs, the bigger the better), has a mini-keyboard that runs on AA-batteries. It is slightly bowed, and comes with a small carrybag. The Radio receiver (not bluetooth—sigh) goes into the USB slot and clips onto the bottom of the keyboard. It is more a laptop accessory, but has a nice feel for desktop use if you don’t mind giving up ARROW keys and a numpad. It’s on the small side. It actually works great by my server where there isn’t much room for a keyboard. And, it can be great for traveling as a Laptop Accessory. I usually connect my HP laptop via HDMI to the Hotel TV. Now I can sit back on the bed and use the keyboard as a wireless remote for Hulu and NetFl ix. 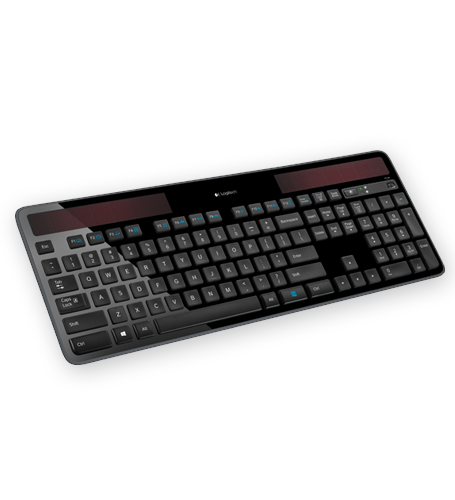 I was set to buy it when I spotted the Logitech k750 solar powered keyboard. Albeit the amount of power drawn by a keyboard is minimal. But the keyboard, less than 3/8” thick, has a solar cell that runs on office light and sunlight (both of which I have in abundance in my workspace). It called out to me. The “green” footprint was interesting. More interesting was I no longer needed batteries or a charger so I could work non-stop into the night. I will see how good the system works in the wee hours of the night. It includes a “backlight” for the keys for night time usage. On the quick travel, it’s great. However, the keyboard is not a quiet as I like. By design, likely, you can hear the clicks. I guess I will be using a headset.